The Marine Geoscience Data System (MGDS) provides a suite of tools and services for free public access to marine geoscience research data acquired throughout the global oceans and adjoining continental margins. 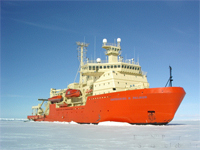 The system evolved from projects initiated from 2003-2004 with funding from the National Science Foundation to provide data management services for the U.S. Antarctic Program (USAP), the Ridge 2000 and MARGINS programs, and for active source seismic data. System components include a digital library and metadata catalog, and the Global Multi-Resolution Topography (GMRT) synthesis, a dynamic multi-resolution gridded synthesis of seafloor bathymetry data integrated with global land topography. Data access services include a key word search tool, and data visualization tools GeoMapApp, and Virtual Ocean. Open Geospatial Consortium (OGC) compliant Web Services are also available to enable access by other data systems and visualization tools. Development of the integrated data system has been underway since 2003 in collaboration with researchers at WHOI, UTIG and TAMU as well as NOAA's National Centers for Environmental Information.